When Electronic Arts opened the EA Broadcast Studio at its headquarters in Redwood City, CA, the videogame publisher’s growing esports operation got a dedicated in-house production studio. The facility, which debuted with the Madden NFL 19 Challenge in mid March, will serve as the year-round home to esports competitions for EA titles like Madden NFL 19 and FIFA 19, which have previously been held at third-party venues. 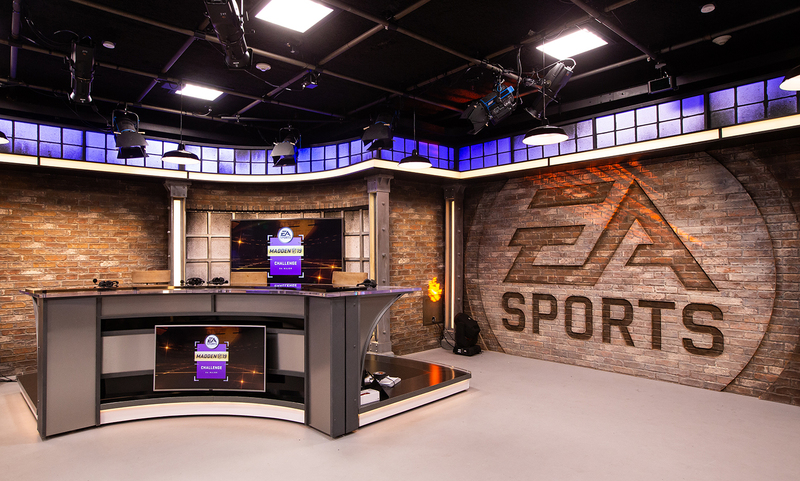 Inside the new EA Broadcast Center, which launched during the Madden NFL 19 Challenge earlier this month. The EA Broadcast Center features two main studios. 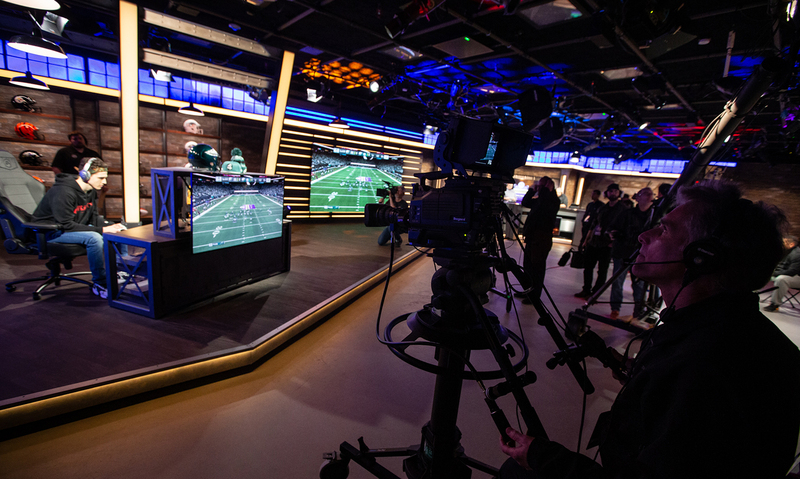 Studio 209 is a 2,300-sq.-ft., 360-degree studio where gameplay takes place; the 1,700-sq.-ft. Players’ Lounge is outfitted with robotic cameras and directional microphones to capture intimate player interactions. Designed by MPKscenic, each features more than 60 video monitors and 200 light fixtures. EA’s 2300-sq-ft, 360-degree Studio 209 serves as home to gameplay and the host set. 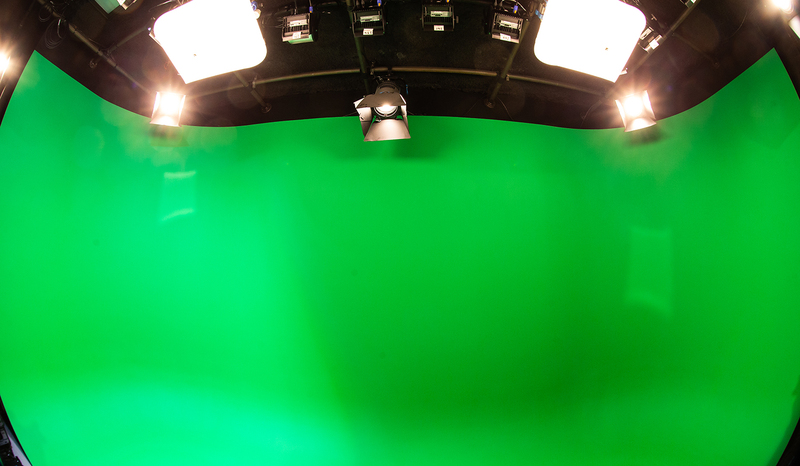 In addition, the new broadcast center houses a 1080p broadcast-control room, AR seamless green screen, and postproduction facilities. EA partnered with systems integrator ASG (Advanced Systems Group) on the project, which was completed in just three months (construction began on Dec. 10; the facility went live on March 10). Studio 209 (named after the 209 Redwood Shores Pkwy. 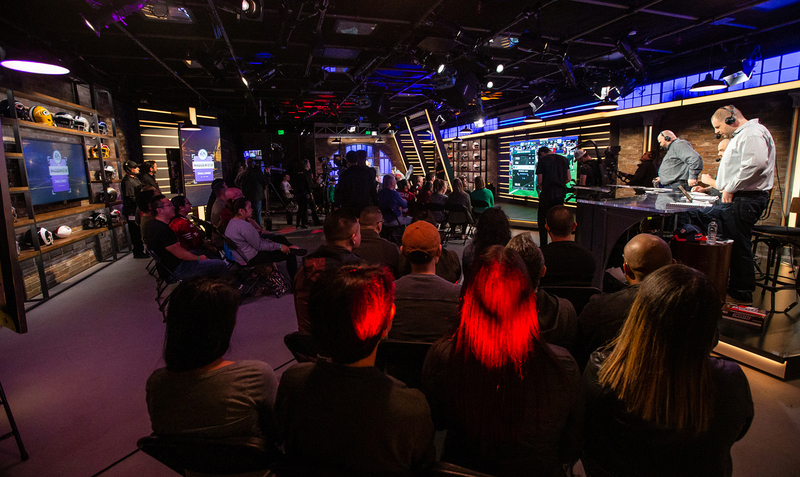 Address of EA HQ) houses dueling player pods for competitions, a four-person caster desk, media/audience seating, a touchscreen analysis monitor, and multiple standup positions. At the heart of Studio 209 is a massive 133-in., 1.5-mm Samsung LED wall that can display customized elements to match the EA game being featured. The studio deploys five Ikegami HDK-99 broadcast cameras with Fujinon lenses, a wireless RF camera, and 10 Marshall CV502-MB POV cameras. The caster desk features built-in gameplay monitors, allowing analysts to look through a clear desktop to watch the in-game playout. 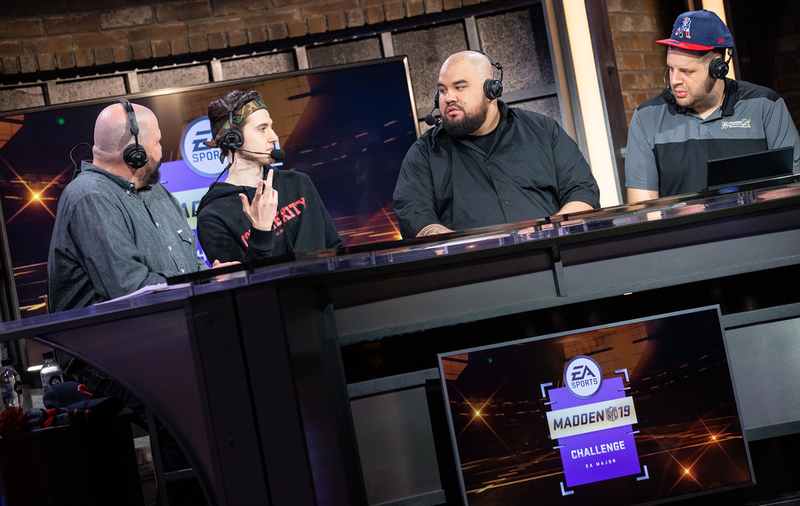 During the Madden NFL 19 Challenge, host/play-by-play caller Scott Cole had one gameplay monitor, and analyst/game designer RG had two monitors: one to monitor gameplay and a multiviewer to watch individual players’ screens as they pick plays. 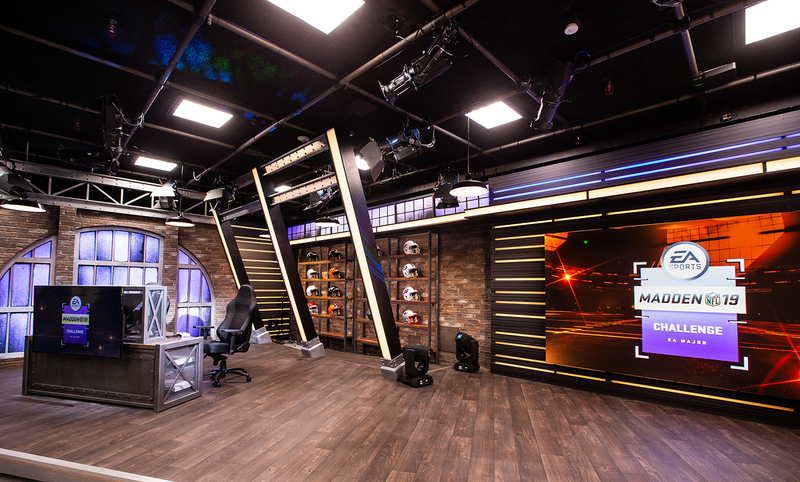 Designed to mimic a New York City loft, the Players’ Lounge is outfitted with four Panasonic AW-UE150KPJ PTZ robotic cameras and three Shure MXA910B ceiling-array microphones to capture exchanges among players. Only players (no non-competing friends or family) are allowed in the Players’ Lounge, which features monitors to allow them to watch their fellow competitors in action. The EA Players’ Lounge features monitors to allow them to watch their fellow competitors in action. Camera feeds from the Players’ Lounge can be integrated live into the show or played back via EVS depending on the situation. A dedicated producer in the control room monitors the Players’ Lounge at all times and is in constant communication with EA’s EVS replay operator. 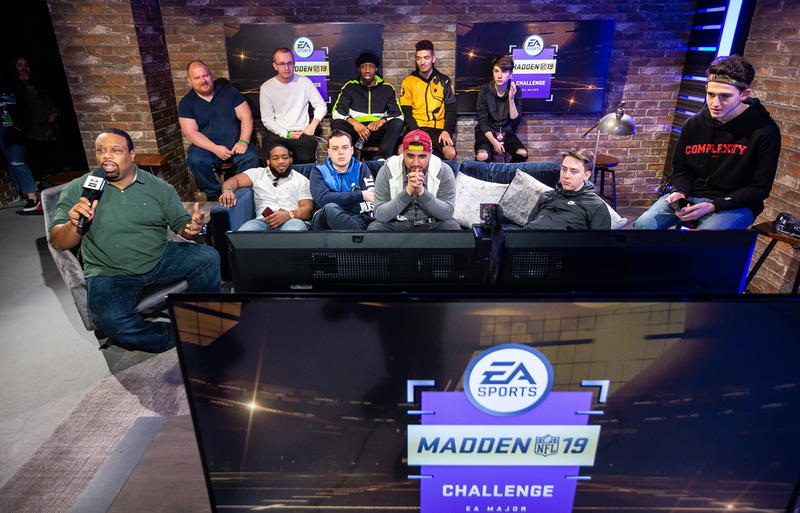 The Players’ Lounge concept debuted during the Madden NFL 19 Club Championship in February (for which EA built a temporary studio in Redwood City) and received positive reviews from fans onsite and watching online. 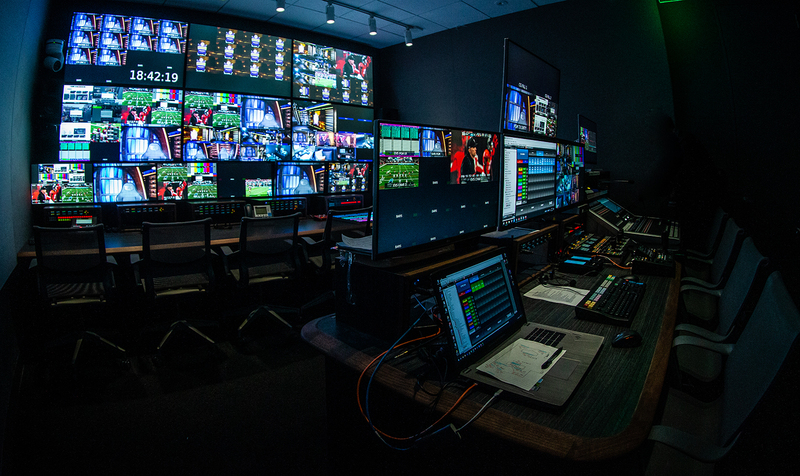 The 1080p broadcast-control room features a traditional front- and back-bench setup and is stacked with Ross Video gear, including a 4M/E Acuity switcher, Ultrix-FR5 12G router (142×142), three-channel Xpression graphics system, and Inception social-media–management system. The control room, which was spearheaded by EA Senior Technical Production Manager Brian Bredenbeck and Senior Producer of Studio Operations and Special Projects Tom Smetham, also houses a 12-channel EVS XT4K replay server (with XFile3 for archive/restore), ADDERLink INFINITY 1002 KVM extender, Leader LV7300 rasterizer, and Evertz Master SPG/Clock system. The audio room is built around a Calrec Brio 36-dual-fader console (128×128) and is heavy on Dante IP connectivity. For comms, EA relies on a Riedel Artist 128 matrix mainframe and Clear-Com FreeSpeak II 1.9 GHz four-channel wireless base station (with 10 beltpacks). The control room is located one floor below the primary data center for EA’s Redwood City campus. With that in mind, Smetham worked closely with the company’s IT department to allocate rack space in the existing data center rather than having to build a machine room for the control room. EA is also preparing for a potential 4K future: the 1080p control room can be easily upgraded to 4K. 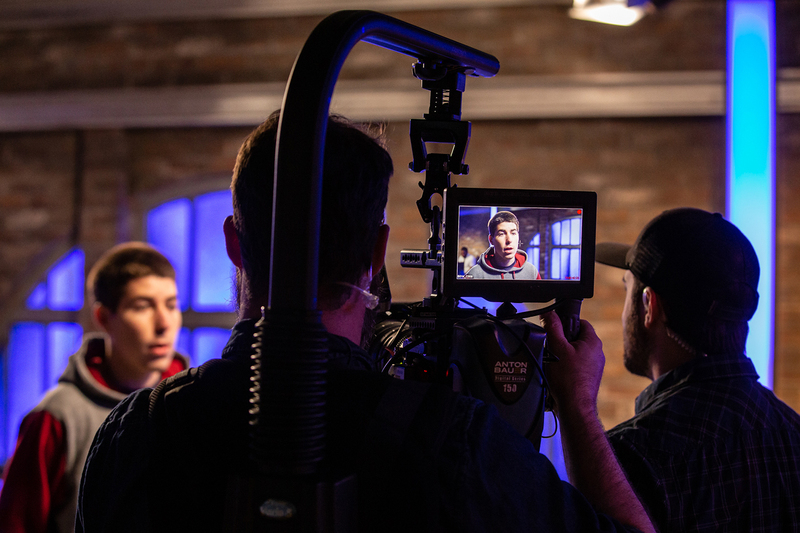 Between tournaments, the new studio will also serve as a content-creation facility for new esports-related shows, player interviews, influencer capture sessions, player-to-EA gameplay feedback panels, and more. Construction and integration for the EA Broadcast Center was completed in just three months (Dec. 10 to March 10). With that in mind, the company added 500 TB of Quantum QXS active storage and 1 PB of StorNext AEL6 offline tape storage to serve its growing content-creation operation. EA has erected an AR seamless green screen at the broadcast center and plans to create a cavalcade of “fun and unique content” both during gameplay and for shoulder programming, according to Lynch. In addition, eye-tracking technology — which pinpoints where players are looking on the screen during gameplay to provide deeper analysis — was installed following opening weekend, and the EA production team is looking to roll it out for the Madden Bowl April 25-27. Stay tuned to the EA Madden NFL Twitch, YouTube, Facebook, and Mixer channels for upcoming action streaming from the EA Broadcast Center.